Home » Funny Folks. » NoH8. Ever. I want to share a link with you. I want to share an experience with you. I want to share a feeling with you. It’s the feeling of belonging to something bigger than you. More powerful with each person. It’s a feeling of WE can affect a change. It’s within each of us. 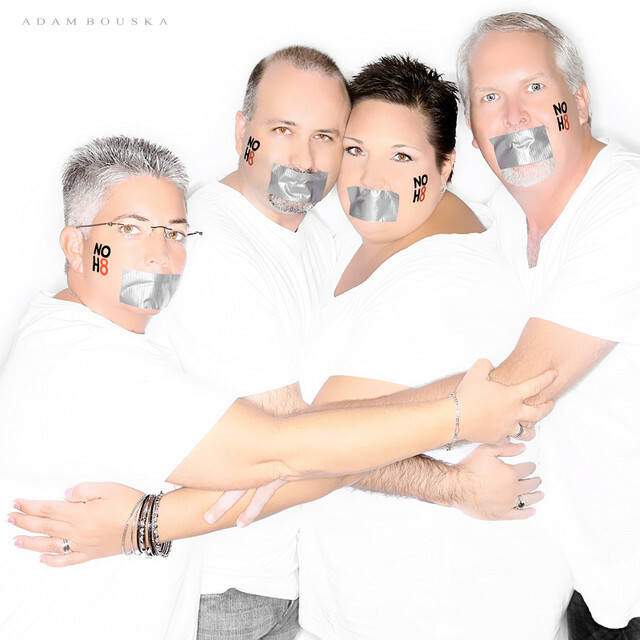 In October, I, along with my wife and two of my dearest friends, participated in the Dallas NoH8 Photo Shoot. It was simple enough, show up, look pretty, wear white and share a message. A message that is simple….there’s not room for hate in love. Love is love. Period. End.of.story. Adam Bouska started this movement, to silently protest Prop 8 in California. And he has continued to spread the word, to share the fight, to take breathtaking photos of everyday people who only have ONE thing in common. Check his website, join the cause…. visit here. This entry was posted in Funny Folks., Life in Photos, That's me, the Girl and tagged Adam Bouska, No H8 Campaign Dallas, NoH8 Campaign, noh8campaign.com. Bookmark the permalink.